Sue customizes the therapeutic treatment according to the client's needs. Various modalities are incorporated into each massage therapy session along with hot stones for trigger points, moist heat packs, ice packs as needed to reduce inflamation, cupping and aromatherapy, all for one low price. Sue uses only 100% organic unrefined coconut massage oil, 100% pure therapeutic grade essential oils and pain relief cream. Each session is a full 60, 90 or 120 minutes. Oncology Massage is a special type of massage developed specifically for cancer patients. Cancer patients have unique needs which must be addressed to make sure that a massage is beneficial to their health. I focus my attention on creating a gentle, nurturing environment for you to relax into. Although massaging people with cancer was once thought to promote the spread of the disease, properly used massage therapy techniques does not cause cancer to spread, according to the Society for Oncology Massage. Oncology massage can significantly reduce pain, fatigue, nausea, depression, and axiety. As we proceed on our personal life's journey, we encounter traumas on physical, mental, emotional or spiritual levels. When these events occur, we attempt to keep going forward by burying the event, thinking we will release it at a later time which more often than not never occurs. With traditional massage and other body work modalities, we physically connect to the body and are trained to follow the physical aspects of the body without understanding how to engage the energetic systems that are also involved. In traditional energy work such as Healing Touch and Reiki, we connect with the energy fields of the body, without the cellular connection. Many energy workers have not received the training to understand the specifies of the different energy systems, and how to merge (or connect) them. Our challenge is to discover how to facilitate the release of held traumatized cellular vibrations on both the physical and energetic levels. One thing that continues to be evident through more and more scientific research is that our cells are at the core of our held memories. Each cell has its own memory and is connected to other cells which are also holding the same memory. Connecting to the cellular memories along with releasing the energetic components of held traumas is the major key in restoring a person's vitality. By combining the gentle connection of touch and the power of energy movement, many deeply held traumas can be cleared. Reiki Reiki, a Japanese healing technique, is gaining popularity in the United States as more and more people seek natural treatments for the mind and body. During a Reiki session the practitioner places his or her hands on or over the client's body, delivering healing energy that breaks up negative blockages and restores positive energy flow. This ancient form of energy healing is based on the idea that we all have an invisible "life force energy" (or Ki) that flows through our bodies and causes us to be alive. This energy, however, is often disrupted by our own negative thoughts and feelings (both conscious and unconscious ones). If your Ki becomes too low, you are at an increased risk of becoming stressed out, sick, tired and unhappy. "Ki is flowing in everything that is alive including plants, animals and humans. When a person's Ki is high, they will feel strong, confident, and ready to enjoy life and take on its challenges. When it is low, they will feel weak and are more likely to get sick," says William Lee Rand, founder and president of The International Center for Reiki Training. How Does Reiki Work? 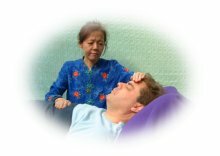 Reiki (pronounced "ray-kee") is a gentle, hands-on technique in which a practitioner channels the healing energy through their hands and into the client. The energy naturally flows where the negative thoughts and feelings are attached, thereby clearing any blockages and restoring a normal flow of energy. In other words, Reiki clears and heals the clouded energy pathways and allows the life force to flow through again. As Reiki flows through a sick or unhealthy area, it breaks up and washes away any negative thoughts or feelings lodged in the unconscious mind/body thus allowing a normal healthy flow of Ki to resume. As this happens, the unhealthy physical organs and tissues become properly nourished with Ki and begin functioning in a balanced healthy way thus replacing illness with health. Chair massage is a popular way of relieving stress. You receive your massage in a specialized ergonomic chair which I bring to your location. In addition to the usual health benefits of massage, another benefit of chair massage is that it is done over the clothing. With seated massage, you can avoid the discomfort and awkwardness that you may feel in disrobing for a traditional massage. Also, chair massage sessions are usually shorter than traditional massage, making it convenient enough to fit into your busy schedule.